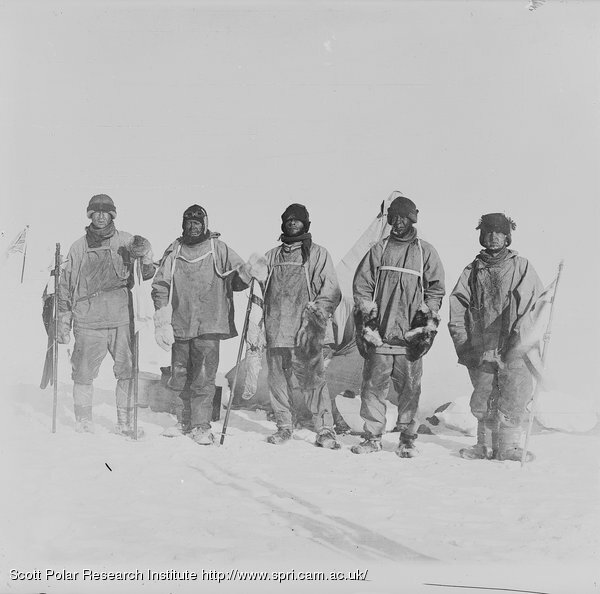 You are currently browsing the archives for the Chapter XVIII: The Summit Journey to the Pole category. Decided after summing up all observations that we were 3.5 miles away from the Pole – one mile beyond it and 3 to the right. More or less in this direction Bowers saw a cairn or tent. The tent is fine – a small compact affair supported by a single bamboo. A note from Amundsen, which I keep, asks me to forward a letter to King Haakon! The following articles have been left in the tent: 3 half bags of reindeer containing a miscellaneous assortment of mits and sleeping socks, very various in description, a sextant, a Norwegian artificial horizon and a hypsometer without boiling-point thermometers, a sextant and hypsometer of English make. Left a note to say I had visited the tent with companions. Bowers photographing and Wilson sketching. Since lunch we have marched 6.2 miles S.S.E. by compass (i.e. northwards). Sights at lunch gave us 1/2 to 3/4 of a mile from the Pole, so we call it the Pole Camp. (Temp. Lunch -21º.) We built a cairn, put up our poor slighted Union Jack, and photographed ourselves – mighty cold work all of it – less than 1/2 a mile south we saw stuck up an old underrunner of a sledge. This we commandeered as a yard for a floorcloth sail. I imagine it was intended to mark the exact spot of the Pole as near as the Norwegians could fix it. (Height 9500.) A note attached talked of the tent as being 2 miles from the Pole. Wilson keeps the note. There is no doubt that our predecessors have made thoroughly sure of their mark and fully carried out their programme. I think the Pole is about 9500 feet in height; this is remarkable, considering that in Lat. 88º we were about 10,500. We carried the Union Jack about 3/4 of a mile north with us and left it on a piece of stick as near as we could fix it. I fancy the Norwegians arrived at the Pole on the 15th Dec. and left on the 17th, ahead of a date quoted by me in London as ideal, viz. Dec. 22. 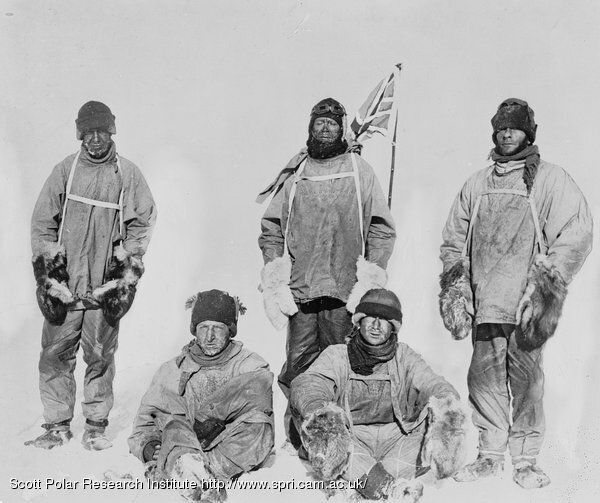 It looks as though the Norwegian party expected colder weather on the summit than they got; it could scarcely be otherwise from Shackleton’s account. Well, we have turned our back now on the goal of our ambition and must face our 800 miles of solid dragging – and good-bye to most of the daydreams! Camp 69. T. -22º at start. Night -21º. The Pole. Yes, but under very different circumstances from those expected. We have had a horrible day – add to our disappointment a head wind 4 to 5, with a temperature -22º, and companions labouring on with cold feet and hands. We started at 7.30, none of us having slept much after the shock of our discovery. We followed the Norwegian sledge tracks for some way; as far as we make out there are only two men. In about three miles we passed two small cairns. Then the weather overcast, and the tracks being increasingly drifted up and obviously going too far to the west, we decided to make straight for the Pole according to our calculations. At 12.30 Evans had such cold hands we camped for lunch – an excellent ‘week-end one.’ We had marched 7.4 miles. Lat. sight gave 89º 53′ 37”. We started out and did 6 1/2 miles due south. To-night little Bowers is laying himself out to get sights in terrible difficult circumstances; the wind is blowing hard, T. -21º, and there is that curious damp, cold feeling in the air which chills one to the bone in no time. We have been descending again, I think, but there looks to be a rise ahead; otherwise there is very little that is different from the awful monotony of past days. Great God! this is an awful place and terrible enough for us to have laboured to it without the reward of priority. Well, it is something to have got here, and the wind may be our friend to-morrow. We have had a fat Polar hoosh in spite of our chagrin, and feel comfortable inside – added a small stick of chocolate and the queer taste of a cigarette brought by Wilson. Now for the run home and a desperate struggle. I wonder if we can do it. Camp 68. Height 9760. T. -23.5º. The worst has happened, or nearly the worst. We marched well in the morning and covered 7 1/2 miles. Noon sight showed us in Lat. 89º 42′ S., and we started off in high spirits in the afternoon, feeling that to-morrow would see us at our destination. About the second hour of the March Bowers’ sharp eyes detected what he thought was a cairn; he was uneasy about it, but argued that it must be a sastrugus. Half an hour later he detected a black speck ahead. Soon we knew that this could not be a natural snow feature. We marched on, found that it was a black flag tied to a sledge bearer; near by the remains of a camp; sledge tracks and ski tracks going and coming and the clear trace of dogs’ paws – many dogs. This told us the whole story. The Norwegians have forestalled us and are first at the Pole. It is a terrible disappointment, and I am very sorry for my loyal companions. Many thoughts come and much discussion have we had. To-morrow we must march on to the Pole and then hasten home with all the speed we can compass. All the day dreams must go; it will be a wearisome return. We are descending in altitude – certainly also the Norwegians found an easy way up. Height 9920. T. -25º. The sledge came surprisingly lightly after lunch – something from loss of weight, something, I think, from stowage, and, most of all perhaps, as a result of tea. Anyhow we made a capital afternoon march of 6.3 miles, bringing the total for the day to over 12 (12.3). The sastrugi again very confused, but mostly S.E. quadrant; the heaviest now almost east, so that the sledge continually bumps over ridges. The wind is from the W.N.W. chiefly, but the weather remains fine and there are no sastrugi from that direction. Camp 67. Lunch obs. : Lat. 89º 26′ 57”; Lat. dead reckoning, 89º 33′ 15” S.; Long. 160º 56′ 45” E.; Var. 179º E.
It is wonderful to think that two long marches would land us at the Pole. We left our depot to-day with nine days’ provisions, so that it ought to be a certain thing now, and the only appalling possibility the sight of the Norwegian flag forestalling ours. Little Bowers continues his indefatigable efforts to get good sights, and it is wonderful how he works them up in his sleeping-bag in our congested tent. (Minimum for night -27.5º.) Only 27 miles from the Pole. We ought to do it now. Lunch camp, Height 9,950. Last depot. During the night the air cleared entirely and the sun shone in a perfectly clear sky. The light wind had dropped and the temperature fallen to -25º, minimum -27º. I guessed this meant a hard pull, and guessed right. The surface was terrible, but for 4 3/4 hours yielded 6 miles (geo.). We were all pretty well done at camping, and here we leave our last depot – only four days’ food and a sundry or two. The load is now very light, but I fear that the friction will not be greatly reduced. Camp 66. Lunch T. -18º, Night T. -15º. Sun showing mistily through overcast sky all day. Bright southerly wind with very low drift. In consequence the surface was a little better, and we came along very steadily 6.3 miles in the morning and 5.5 in the afternoon, but the steering was awfully difficult and trying; very often I could see nothing, and Bowers on my shoulders directed me. Under such circumstances it is an immense help to be pulling on ski. To-night it is looking very thick. The sun can barely be distinguished, the temperature has risen, and there are serious indications of a blizzard. I trust they will not come to anything; there are practically no signs of heavy wind here, so that even if it blows a little we may be able to march. Meanwhile we are less than 40 miles from the Pole. Again we noticed the cold; at lunch to-day (Obs. : Lat. 89º 20′ 53” S.) all our feet were cold, but this was mainly due to the bald state of our finnesko. I put some grease under the bare skin and found it made all the difference. Oates seems to be feeling the cold and fatigue more than the rest of us, but we are all very fit. It is a critical time, but we ought to pull through. The barometer has fallen very considerably and we cannot tell whether due to ascent of plateau or change of weather. Oh! for a few fine days! So close it seems and only the weather to baulk us. Lunch Height 10,390. Barometer low? lunch Lat. 89° 3′ 18”. Started on some soft snow, very heavy dragging and went slow. We could have supposed nothing but that such conditions would last from now onward, but to our surprise, after two hours we came on a sea of sastrugi, all lying from S. to E., predominant E.S.E. Have had a cold little wind from S.E. and S.S.E., where the sky is overcast. Have done 5.6 miles and are now over the 89th parallel. Night camp 65.—Height 10,270. T. -22.5°, Minimum -23.5°. Lat. 89° 9’S. very nearly. We started very well in the afternoon. Thought we were going to make a real good march, but after the first two hours surface crystals became as sandy as ever. Still we did 5.6 miles geo., giving over 11 for the day. Well, another day with double figures and a bit over. The chance holds. It looks as though we were descending slightly; sastrugi remain as in forenoon. It is wearisome work this tugging and straining to advance a light sledge. Still, we get along. I did manage to get my thoughts off the work for a time to-day, which is very restful. We should be in a poor way without our ski, though Bowers manages to struggle through the soft snow without tiring his short legs. Only 51 miles from the Pole to-night. If we don’t get to it we shall be d——d close. There is a little southerly breeze to-night; I devoutly hope it may increase in force. The alternation of soft snow and sastrugi seem to suggest that the coastal mountains are not so very far away. Camp 64. T. -17.5°. Lat. 88° 57′. Another heavy march with snow getting softer all the time. Sun very bright, calm at start; first two hours terribly slow. Lunch, 4 3/4 hours, 5.6 miles geo. ; Sight Lat. 88° 52′. Afternoon, 4 hours, 5.1 miles—total 10.7. In the afternoon we seemed to be going better; clouds spread over from the west with light chill wind and for a few brief minutes we tasted the delight of having the sledge following free. Alas! in a few minutes it was worse than ever, in spite of the sun’s eclipse. However, the short experience was salutary. I had got to fear that we were weakening badly in our pulling; those few minutes showed me that we only want a good surface to get along as merrily as of old. With the surface as it is, one gets horribly sick of the monotony and can easily imagine oneself getting played out, were it not that at the lunch and night camps one so quickly forgets all one’s troubles and bucks up for a fresh effort. It is an effort to keep up the double figures, but if we can do so for another four marches we ought to get through. It is going to be a close thing. At camping to-night everyone was chilled and we guessed a cold snap, but to our surprise the actual temperature was higher than last night, when we could dawdle in the sun. It is most unaccountable why we should suddenly feel the cold in this manner; partly the exhaustion of the march, but partly some damp quality in the air, I think. Little Bowers is wonderful; in spite of my protest he would take sights after we had camped to-night, after marching in the soft snow all day where we have been comparatively restful on ski. Night position.—Lat. 88° 57′ 25” S.; Long. 160° 21′ E.; Var. 179° 49′ W. Minimum T. -23.5°. Only 63 miles (geo.) from the Pole to-night. We ought to do the trick, but oh! for a better surface. It is quite evident this is a comparatively windless area. The sastrugi are few and far between, and all soft. I should imagine occasional blizzards sweep up from the S.E., but none with violence. We have deep tracks in the snow, which is soft as deep as you like to dig down. Camp 62. T. -11º. Last depot 88º 29′ S.; 159º 33′ E.; Var. 180º. Terrible hard march in the morning; only covered 5.1 miles (geo.). Decided to leave depot at lunch camp. Built cairn and left one week’s food together with sundry articles of clothing. We are down as close as we can go in the latter. We go forward with eighteen days’ food. Yesterday I should have said certain to see us through, but now the surface is beyond words, and if it continues we shall have the greatest difficulty to keep our march long enough. The surface is quite covered with sandy snow, and when the sun shines it is terrible. During the early part of the afternoon it was overcast, and we started our lightened sledge with a good swing, but during the last two hours the sun cast shadows again, and the work was distressingly hard. We have covered only 10.8 miles (geo.). Only 85 miles (geo.) from the Pole, but it’s going to be a stiff pull both ways apparently; still we do make progress, which is something. To-night the sky is overcast, the temperature (-11º) much higher than I anticipated; it is very difficult to imagine what is happening to the weather. The sastrugi grow more and more confused, running from S. to E. Very difficult steering in uncertain light and with rapidly moving clouds. The clouds don’t seem to come from anywhere, form and disperse without visible reason. The surface seems to be growing softer. The meteorological conditions seem to point to an area of variable light winds, and that plot will thicken as we advance. Lunch. Height 10,540. T. -15° 8′. It was heavy pulling from the beginning to-day, but for the first two and a half hours we could keep the sledge moving; then the sun came out (it had been overcast and snowing with light south-easterly breeze) and the rest of the forenoon was agonising. I never had such pulling; all the time the sledge rasps and creaks. We have covered 6 miles, but at fearful cost to ourselves. Night camp 63. Height 10,530. Temp. -16.3°. Minimum -25.8°. Another hard grind in the afternoon and five miles added. About 74 miles from the Pole—can we keep this up for seven days? It takes it out of us like anything. None of us ever had such hard work before. Cloud has been coming and going overhead all day, drifting from the S.E., but continually altering shape. Snow crystals falling all the time; a very light S. breeze at start soon dying away. The sun so bright and warm to-night that it is almost impossible to imagine a minus temperature. The snow seems to get softer as we advance; the sastrugi, though sometimes high and undercut, are not hard—no crusts, except yesterday the surface subsided once, as on the Barrier. It seems pretty certain there is no steady wind here. Our chance still holds good if we can put the work in, but it’s a terribly trying time.